There is a way to develop your preschooler's intellectual abilities, while preserving the wonder and innocence of childhood. Children's days filled with tutors and intense lessons...Mom nervous that her child is not keeping up with his or her peers...Dad buying the latest gadget that promises to make his child more intelligent...Parents running to the mailbox to see if their child was accepted to the "best" preschool...Sadly, this is the reality for many three-, four-, and five- year-olds and their families. There is a better way. 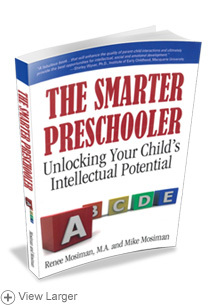 Authors Renee and Mike Mosiman have combined their talents to share their practical, reassuring, and tried-and-true advice for raising a smarter preschooler who is emotionally healthy and socially well adjusted. What kind of play teaches valuable skills? How can I make the most of reading time? Will listening to Mozart really make my kid smarter? Is educational TV good for my youngster?